- Publisher This book is a practical response to the experience of teaching in a variety of different settings from university undergraduates, through WEA, to parish groups. This book will thus adopt an approach radically different to that of many general Church histories in terms of length, structure and presentation. The broad underlying theme of the book will be the interaction between Christianity and the secular world, exploring how one has shaped and been shaped by the other, reflecting the title of the book. In order to achieve this, the book will not attempt to cover the whole of Christian history (this has been done frequently by others), but rather it will focus on a number of specific themes and chronological periods. The four themes will be Belief, Practice, Organisation and Propagation. There will be four chronological divisions, chosen as pivotal in the development of Christianity, and reflecting the conventional divisions of history into ancient, medieval, early and later modern. This will enable the book to be used as either a general introduction to Christian history or as a starting point for further investigation of one or more periods. The periods are: The Imperial Church (300-500) The Medieval Church (1050-1250), The Reformation Church (1450-1650) The Modern Church (1800-2000). There will be included maps, timelines, quotations from primary source material, a glossary and a further reading section. 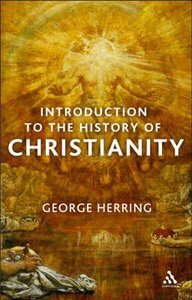 An Introduction to the History of Christianityis a beautifully crafted and clearly written introduction to Christianity over its 2,000 year history concentrating on the interraction between the sacred and the secular.This book will adopt an approach radically different to that of many general Church histories in terms of length, structure and presentation. The broad underlying theme of the book will be the interraction between Christianity and the secular world, exploring how the one has shaped and been shaped in its turn by the other. In order to achieve this the book will not attempt to cover the whole of Christian history in detail ( this has been done frequently by others ) but rather it will focus on a number of sepecific chronological periods and themes. Three, two hundred year periods have been chosen as pivotal in the development of Christianity, reflecting the conventional divisions into ancient, medieval and early modern. As well as considering the broad themes of belief, practice, organisation and propagation, it will also examine what Christians have meant by their use of terms like authority, tradition, reform or hierarchy. Manageable in length, this will enable the book to be used either as a general introduction to Christian history or as a starting point for further investigation of one or more periods. To help facilitate this each chapter concludes with a detailed section of suggested further reading. About "An Introduction to the History of Christianity"
This book is a practical response to the experience of teaching in a variety of different settings from university undergraduates, through WEA, to parish groups. This book will thus adopt an approach radically different to that of many general Church histories in terms of length, structure and presentation. The broad underlying theme of the book will be the interaction between Christianity and the secular world, exploring how one has shaped and been shaped by the other, reflecting the title of the book. In order to achieve this, the book will not attempt to cover the whole of Christian history (this has been done frequently by others), but rather it will focus on a number of specific themes and chronological periods. The four themes will be Belief, Practice, Organisation and Propagation. There will be four chronological divisions, chosen as pivotal in the development of Christianity, and reflecting the conventional divisions of history into ancient, medieval, early and later modern. This will enable the book to be used as either a general introduction to Christian history or as a starting point for further investigation of one or more periods. The periods are: The Imperial Church (300-500) The Medieval Church (1050-1250), The Reformation Church (1450-1650) The Modern Church (1800-2000). There will be included maps, timelines, quotations from primary source material, a glossary and a further reading section. The Imperial Church; The Medieval Church; The Reformation Church; The Modern Church.